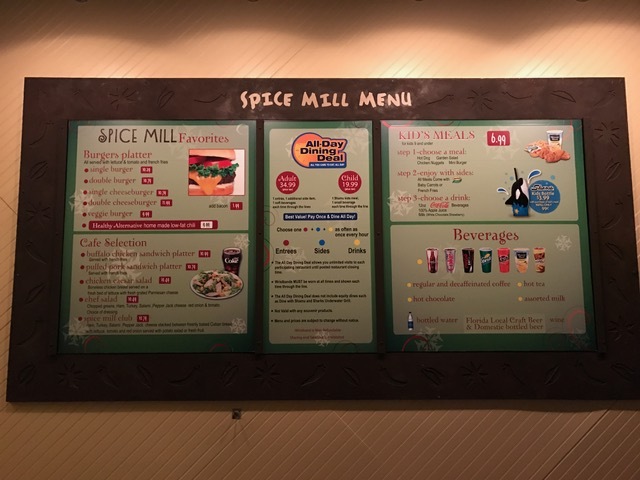 Spice Mill, a quick service restaurant at SeaWorld Orlando, serves burgers, fries, and sandwiches cafeteria-style. I tried Spice Mill a few months back and was really impressed with the chef interaction and the burger that I had. On this visit, Brandon and I had been enjoyed SeaWorld’s Christmas festivities — which are so much fun & I would highly recommend. But, of course, we needed to grab a bite to eat in the midst of all of the fun. I really love the interior of Spice Mill. Despite the fact that it’s a cafeteria style restaurant, there are a lot of nice touches and decor that help boost up the ambiance. I also like that Spice Mill carries several allergy friendly snacks. Not all are gluten free, but they do have several options. They can easily be found behind the counter at most quick service locations.